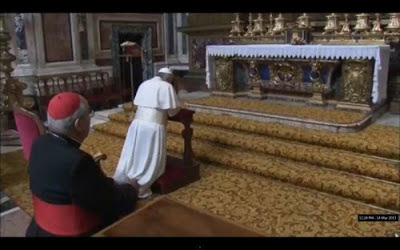 At the Day With Mary last Saturday, some people said to me that they were praying for a Marian Pope. Last night, Pope Francis said "Tomorrow I wish to go and pray to Our Lady, that she may watch over all of Rome." 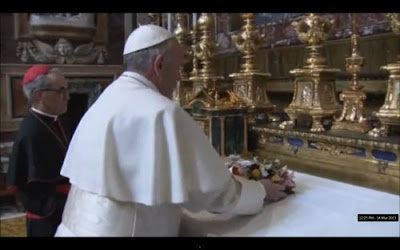 This morning at about 8am, the Holy Father visited the Basilica of St Mary Major and prayed before the icon of Our Lady Salus Populi Romani after placing a small bouquet of flowers on the altar. So it seems the prayers were answered and we do have a Marian Pope.